During the NBA Lockout Miami Heat forward Lebron James has been playing football with his former high school team, St. Vincent-St. Mary. James has been practicing with the team in full pads which as a result has gained the attention of the media and has started a question, is Lebron James going to switch sports and play football? “Should I?” A question that James was hinting towards; should he play football. The tweet immediately spread by users re-tweeting and responding to James tweet as everyone was shocked that this “football thing” was going this far. 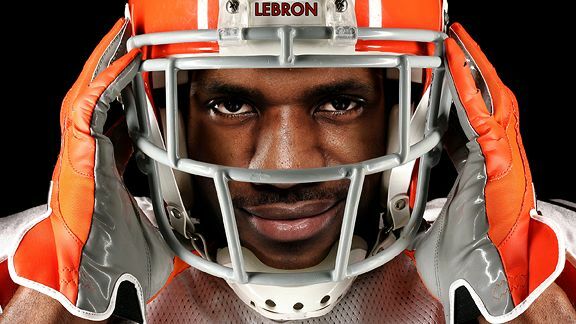 So does this mean that Lebron James is considering playing football this season in the NFL? It seems that way indeed, strike one: Lebron James practices with his former high school football team in full pads, strike two: James asks the fans if he should play football, strike three: James asks ESPN’s John Clayton when the free agent deadline is. Those three strikes are all leading up to what could possibly be another decision; to play or not to play? That is the question. Now let’s just say that James decides to play, where would he go? Buffalo Bills: Why not? They’re hot and on fire and the addition of Lebron James to their football team couldn’t hurt them at all, it would only help them. Now say that James doesn’t live up to the hype and can’t play, then their back in the same situation that they were in before except with a bigger fan base. 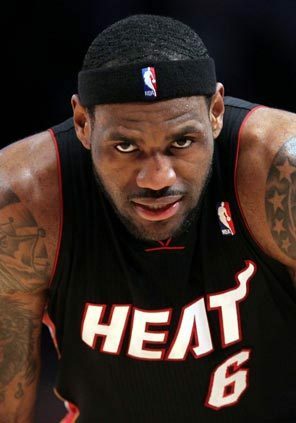 Miami Dolphins: Wouldn’t that be something, Lebron James takes his talents to South Beach again. James could really fit into their offense and at 0-4 what’s the worse that could happen? Cleveland Browns: A coming home party? How would Cleveland react is the big question…would they let him back or would they boo? However James would make a nice fit in Cleveland at either the receiver or even a tight end position. Chicago Bears: The city of Chicago took part in a transition like this before when Michael Jordan left basketball to play for the Chicago White Sox, so why not again? Let’s face it when your running back is your leading your receiver you know that you’re in trouble. Devin Hester, isn’t going to work out maybe he’ll break a long one here or there but he’s a return specialist not a receiver. Then too Jonny Knox; he’s not bad but he shouldn’t be a number one receiver on any team. Then to Roy Williams; reunited with Mike Martz and expected to have the season of his career, well six receptions, 81 yards, and zero touchdowns doesn’t sound that great to me. San Francisco 49ers: On the west coast, in California, which has Lebron James written all over it. The 49ers need a receiver because who knows when Braylon Edwards is coming back, Josh Morgan has a broken a leg, Michael Crabtree is basically getting paid for free and that’s about it. So lace them up big fella because San Fran is just a phone call away. Pete Carroll and Lebron James are doing more than just tweeting, they’re actually talking and what their talking about, is James suiting up in Seattle. With two good receivers as their starters it wouldn’t seem to make any sense to bring in Lebron James, but it does; it makes perfect sense. Not only will he bring some talent, but he’s going to bring media, fans, and more. Other teams: Dallas Cowboys- Jerry Jones is all about signing big name players that bring attention to his football team and with that being James’s favorite team, the two sides might just work something out. Tennessee Titans- It could happen, while it’s very low, it could happen. Another injury or two and James could just slide his way in there. Houston Texans, Oakland Raiders, Atlanta Falcons. Now James wouldn’t be the first player to make the move from basketball to football as there has been players to do so such as Tony Gonzalez and Antonio Gates. However the only problem is, James has been away from the game of football for about eight years and just ask anyone that’s a long time so it’s very questionable if he would be any good. However that’s why James has been preparing for the move, by practicing with his former high school. As of right now James hasn’t signed with a team or talked with any yet, because he’s trying to find an agent which he’s doing right now. Give it about another two weeks and if the lockout is still in tack which it should be, you will be seeing James in a football jersey. Home Depot? Man times must really be tough. With the NBA now in a lockout and the season at stake players have been talking about taking their talents overseas to continue playing. However some players are deciding to go elsewhere and with China not allowing NBA players who are under contract to come and play players are going to have to work elsewhere. West a pretty good talent isn’t able to take his talents overseas due to gun charges that took place back in September. When he asked the judge if he could head overseas the judge replied telling him that he wasn’t allowed to leave the country. So West made a decision except he didn’t make on ESPN or on any other television station, he made it on the computer at the Home Depot. Its official the application is submitted and West may be an Orange and White within the next couple weeks. Though I wonder what he applied for; cashier? Clean up crew? However all jokes aside what if he didn’t get the job. 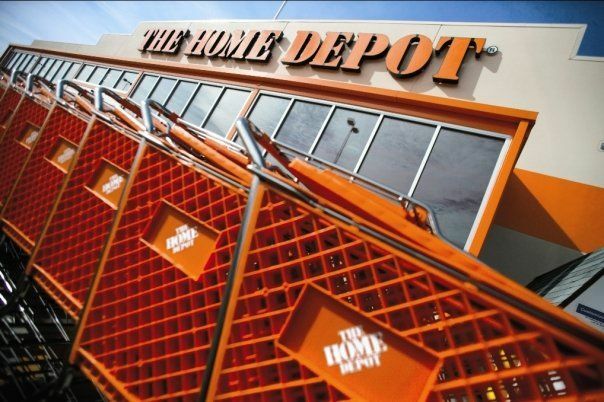 That would make matters even worse, “NBA player denied by Home Depot”, that wouldn’t be good. Hopefully for West’s sake he does get the job but just incase I’m sure McDonalds and Burger King are hiring to. Miami’s big three at Best Buy as the Geek Squad…it could help build some chemistry though I don’t know if Lebron would get the job because Best Buy really struggled last year in the 4th quarter. If he didn’t get it Lebron could always open up a shooting clinic. Kevin Durant working at Finish Line selling backpacks. Dwight Howard at Walmart greeting customers and handing out stickers, saying have a nice day. He has the smile for it. Gilbert Arenas serving as a hit man. Ron Artest working as a therapist. Michael Redd as a doctor he knows pretty much every injury known to man. John Wall as a dance instructor. Tony Parker replacing Eva Longoria on Desperate Housewives. Or they could just take the easy way out like Kris Humphries and marry someone rich. Nonetheless, best of luck Delonte. P.S. if you do get the job when I apply can I use you as a reference? Carmelo Anthony: He started the 2010-11 NBA season with the Denver Nuggets until he ended up getting his wish of getting traded right before the NBA trade deadline. 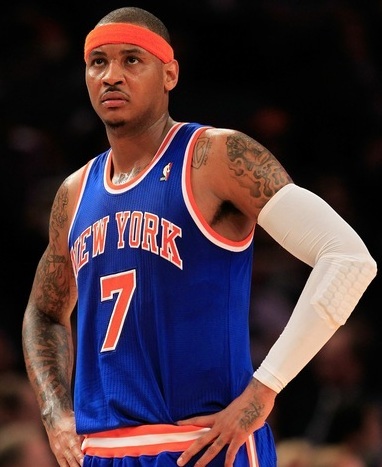 Anthony would end up getting traded to the New York Knicks in a multi player deal. Anthony would join forces with Amare Stoudemire who took his talents to New York during the off-season. Anthony did it once and now he could do it again this year in the case of a lockout. Chances of Anthony going overseas if there’s a lockout: 70 Percent. After signing Deron Williams the Besiktas have been going after more and more NBA players. However their problem is money. Meeting with Kobe Bryant during the first week of August the Besiktas who are trying to sign Bryant won’t have enough money to do so. So they will have to try and get a sponsorship. Now this causes a problem for Anthony and the other players that the Besiktas have contacted because, Bryant’s first on their wish list and their only going to be able to get so many sponsorships, so that means only so many players. In the most realistic case they’ll probably be able to get Bryant and possibly another player maybe two…tops. So unless Anthony has another team in mind playing overseas next season might not be an option. Dwyane Wade: He’s a business man and a great player. He Brought in Chris Bosh and then he brought in Lebron James. Though, the loss in the NBA Finals to the Dallas Mavericks was a devastating blow to the big three. Now about one year later from making their decision to team up the big three will have to make a decision to prepare for the lockout; take their talents overseas or stay home. With James looking like he’s leaning towards staying home one would think that they would all do the same thing. Chances of Wade going overseas if there’s a lockout: 30 Percent. Despite James not favoring the decision to go and play overseas isn’t much of a problem as Wade makes the decisions. He brought in Bosh and he brought in James, so the effect of James not really wanting to go overseas doesn’t really affect Wade, but you never know it might. Sometimes losses can bring people closer or further apart. Though just like they did it last off-season they kept their thoughts and ideas on quiet level where not to many people knew what they were thinking. They could be doing it again or they might not be doing it at all. However Wade saying that he’s not sure about playing in the Olympics with team USA in London might be a little sign of foreshadowing that he’s not going to play overseas next year either. Derrick Rose: He was the 2010-11 NBA M.V.P. Averaging, 25.0 points per game Rose lead his team to the playoffs as the number one seed headlining the Chicago Bulls as the front runners for the Eastern Conference. Rose who’s been playing overseas in exhibition games this summer is showing that he doesn’t take days off. So what will he do next season if the NBA takes a whole season off? 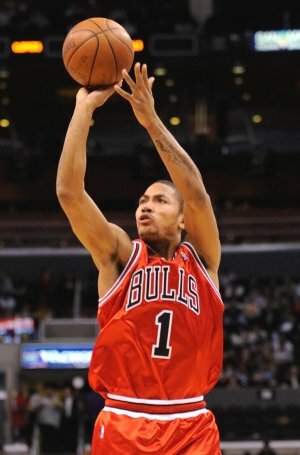 Chances of Rose going overseas if there’s a lockout: 100 Percent. He said he wore down in the Eastern Conference Finals to the Miami Heat last season. That’s why this off-season Rose has had few days off. So in the case of a lockout next year Rose won’t be sitting it at home, he’ll be playing basketball and working hard so when the NBA re-opens their doors Derrick Rose will be ready to take another shot at getting his first NBA Championship ring and this time he won’t wear down. Blake Griffin: Blake Griffin shocked the world this year by the way he played, with so much intensity to the high flying dunks to the high flying blocks; if you could dream it Blake Griffin could do it. Griffin even dunked over a car. Though, with the NBA season at risk for next season Griffin unlike other NBA players isn’t really considering playing overseas. Why it seems like the Griffin won’t be taking his talents overseas next season in the scenario of a lockout, is just completely false. If there’s no basketball season next year Griffin won’t sit out, because he’s not that type of player, that’s why he said “never say never” because he knows and I know that he won’t take a year off from the game of basketball, that’s just not him. 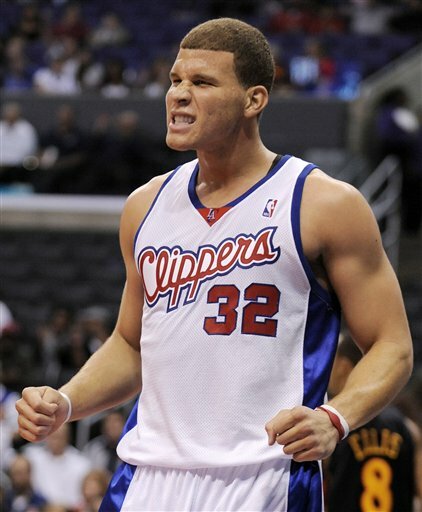 What Blake Griffin is doing is a putting a cover-up for the NBA. What Griffin is doing is believing that the NBA will get everything taking care of by the start of the season and that himself and the other NBA players will lace up for another exciting season, and by his comments that he said he’ll end up looking like a superhero for not bailing on the NBA. 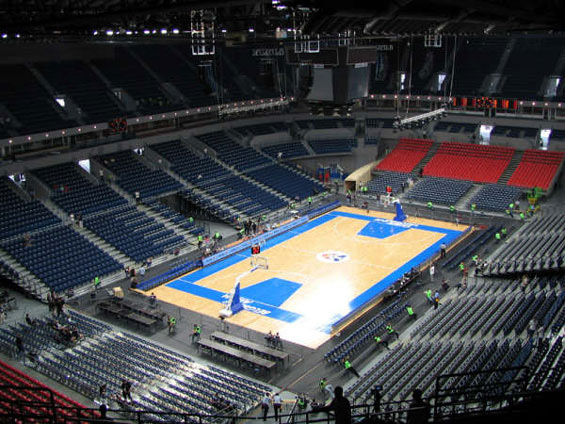 So don’t worry Blake Griffin fans if the NBA locks its doors Griffin will be on the next plane to Turkey or China lacing up for a team over there. Kevin Durant: Dominating the NBA for yet another season Kevin Durant fell just two series short of an NBA title. However putting that in the back of his mind Durant bounced back quick as he joined the Drew League fine tuning his skills for next season. Only one problem; will there be a next season this upcoming year? 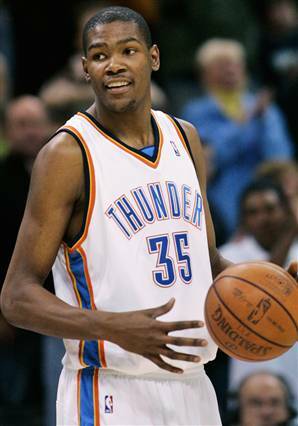 Chances of Durant going overseas if there’s a lockout: 100 Percent. Just like the majority of the NBA players playing in the NBA is their first option. That mindset is the same for Kevin Durant. Though he expressed that he would love to try something new in the event of a lockout such as going overseas to play basketball, he also stressed that the NBA is his first option. Now the problem here is that how dedicated to the NBA is he really? With NBA owners not wanting their players to go overseas due to the risk of injury the question of going overseas gets even bigger as do they obey their owner or disobey? This will then bring up the idea of the D-League which many players could also end up playing in during the lockout as it’s not as good of pay compared to overseas, but players can still play basketball at a competitive level and do it in their home country. Come back on Friday for the next five players. Players will be picked by the fans, so to pick what player or players that you would like to be chosen comment below. 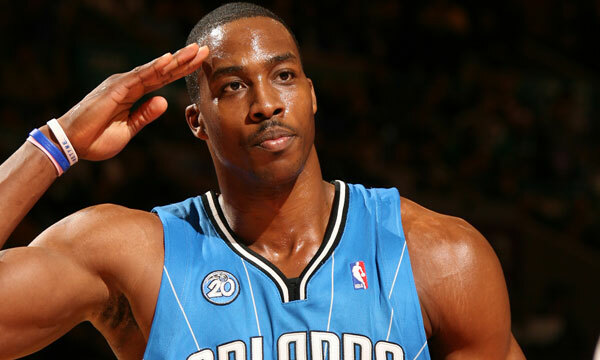 NBA Lockout Breakdown: Dwight Howard, Kobe Bryant, Lebron James, Chris Paul, and Dirk Nowitzki will land. Who will take their talents overseas? Last off-season Lebron James took his talents to south beach to join forces with Chris Bosh and Dwayne Wade in Miami. Many called it “disgraceful” “un-professional,” some even said that it was going to ruin his career. However what if more players took their talents to other teams, or now with the lockout maybe another league, or even another country? What would they say then? Would it be okay? On Friday July 8th guard Deron Williams agreed on a one year deal of $5 million with the Besiktas a team in Turkey that Allen Iverson played for last year. Williams the first NBA player this off-season decided that it was the right move and the right fit for him. Williams deciding to go to Turkey now opens the door even more now for more NBA players to follow in his footsteps. So let’s break it down. Dwight Howard: While the Los Angles Lakers have been the destination that many have been saying that Superman will land, now due to the NBA Lockout it may not. Not only will it might not be Los Angles, but it may not even be an NBA team. As of right now it looks like Howard may be taking his talents to another country. “I’m not at liberty to talk about it,” Howard said to the associated press. “But there’s a huge possibility about me going to China or me going overseas to play basketball.” Well you heard it from the man himself it’s a huge possibility. “I don’t want to just sit over here and forget about basketball and waste, you know, opportunities for me to get better,” said Howard to the press. Chances of Howard going overseas if there’s a lockout: 100 Percent. While money isn’t really a concern for Howard, playing time is and being as young and as talented as Howard is going overseas for a year during a lockout would be a great decision. Kobe Bryant: While his name has come up in the talks before, Kobe Bryant has been the “player to get” to go overseas this off-season. Due to his high popularity that Bryant has generated worldwide in countries like China, teams have been talking with Bryant’s agent trying to make a deal for Bryant to go. Now while China has been the place Bryant has been rumored to go, the Besiktas who recently just signed Deron Williams said that they were looking to sign Bryant as well. The two parties Bryant and the Besiktas will meet in the first week of August to discuss terms about Bryant playing for them next season. Chances of Bryant going overseas if there’s a lockout: 100 Percent. Age isn’t a concern. Even at 33 (Which he’ll be at the time of playing) Bryant hasn’t shown any signs of slowing down and with the competitive edge that Bryant has the odds of him taking a season off are slim to none. Another concern that also stops players from going overseas is the new culture, the new language, and the different people that they would have to adjust to. In Bryant’s case who spent a good chunk of his childhood overseas in Italy due to his father Joe Bryant who played professionally overseas for seven sesasons already knows what its like to move from the United States to another country. Also with the great experience that his father had overseas I wouldn’t see why Bryant wouldn’t go and play. Lebron James: After the treacherous off-season that was marked by “The Decision” and the 4-2 loss in the NBA Finals to Dallas Mavericks, Lebron James is looking to make people forget and forgive. 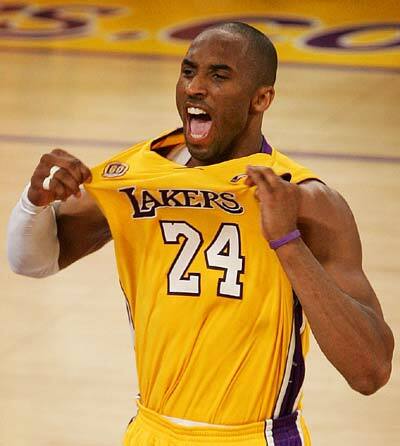 While an NBA Lockout doesn’t help the loved and hated superstar it does show light at the end of the tunnel. While a season without the NBA would force players to take a season “off” it could one lower the tensions that the fans have given James and two it could also help him get back their respect, by making the right decision. Take a year off or take his talents to east to the other side of the world and play basketball for a season there. Chances of Lebron James going overseas if there’s a lockout: 50 Percent. Reason being he’s made the wrong decision before and who knows if he’ll do it again. Now if Kobe Bryant and other superstars do take their talents overseas James should do so as well. The question is, will he? The answer probably, that would be the best choice. Though I don’t know he’s shocked some people before, just ask Cleveland. Chris Paul: While Paul and other NBA stars are playing overseas in exhibition games this summer, it doesn’t necessarily mean that their going to play overseas if there’s a lockout. All their doing as of right now is having fun, staying in shape, and playing basketball. While it could persuade some of them at the end of the day it’s just good fun. 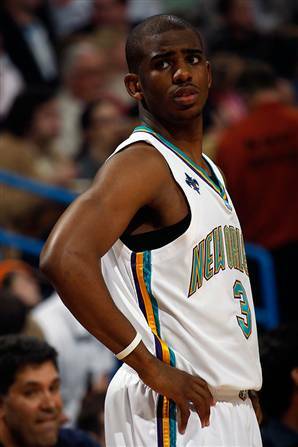 Chances of Chris Paul going overseas if there’s a lockout: 20 Percent. Now you would think at age 26 and as popular as Paul is that it would be a no brainer that he would go and play overseas, well your wrong. Now he’s not going to take a season off by no means, he’s just not going across the sea. Hornets President Hugh Weber said that the franchise intends to eventually have a single-affiliation D-League team in Louisiana. Now while the NBA will have a lockout the D-League will not. The D-League will stop operate and pay the players just like it’s been doing for several years. Now you may think that the D-League won’t have enough competition for Paul and your right. Though, that won’t be the case because more players that don’t want to go overseas, will take their talents to the D-League and play. This will keep them in shape and in the United States still building the reputation of the NBA. 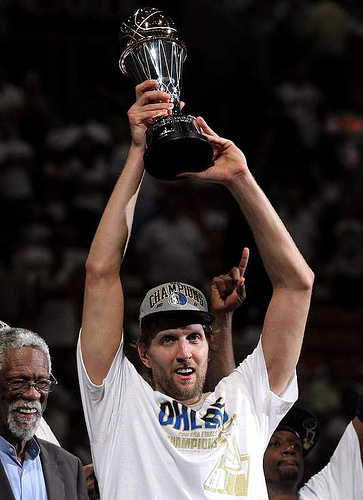 Dirk Nowitzki: Coming off of his first NBA Championship the Finals M.V.P. at age 33 could use some rest. However Nowitzki intends to play for Germany in the European Championships in Lithuania. Nowitzki born and from Germany many would think that in the case of a lockout would go over and play in Germany. However Dallas Mavericks owner Mark Cuban who Nowitzki has a great relationship with doesn’t really approve of players who are under contract to go and compete overseas. Chances of Dirk Nowitzki going overseas if there’s a lockout: 10 Percent. Now while you can’t count it out just yet, the chances of Nowitzki going overseas to play are very unlikely. Now while he won’t take a season off by any means as he’ll continue his routine workouts and that entire but at age 33 he might not play. Even though age isn’t the biggest factor for Nowitzki what is, is Mark Cuban. Cuban who doesn’t like players competing overseas while under contract is going to be a concern, while Nowitzki does occasionally compete for his team in the Olympics that may just be enough. Nowitzki who will most likely will play in the European Championships this summer will use that and then the workouts and come the 2012-13 season he’ll be good to go for his quest at another ring. Come back on Saturday and see where Carmelo Anthony, Dwyane Wade, Derrick Rose, Blake Griffin, and Kevin Durant will go if there’s a lockout.